I know I know, although it is the first day of September and I should really post this while it's still August. Well, you see, I was gonna wait til the last few days of August to write this blog but due to some internet problem at home I couldn't post it til today. 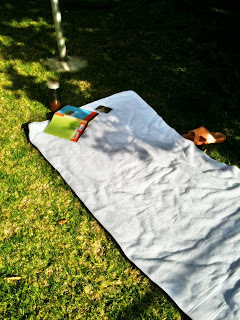 Have you ever try Backyard Sunbathe? Though it was towards the end of winter, having a nice warm day in August still a luxury wish. Therefore, when a sunny day like this arrived, I decided to read a good book AND have a sunbathe out in my backyard. I even take a quick nap. I have to say it was one of the best relaxing day ever! Well, you might ask: why don't just go to the beach since it's a nice day? Because 1) the beach is pretty far from my house 2) it's windy at the beach- the wind towards the end of winter is still quite cold. 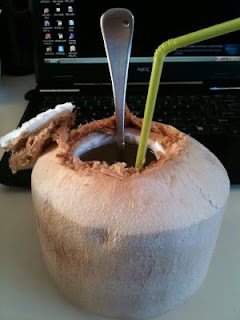 Coconut drink is my all time favourite. I remembered growing up in Kota Kinabalu (Malaysia), one of my favourtie to-go place during weekend was the Tanjung Aru Beach. There were many small stalls selling different kind of malaysian snacks and desserts... and of course Coconut drink! My sister and I, almost every time, would ordered the coconut drink. So imaging how surprised and excited I was when I found the coconut in Woolworth(Adelaide's local supermarket) and most importantly, it's only $2.30!!! Seriously, this was the first time I saw them selling coconut in supermarket. If they are not that heavy,I would have bought 3-4 of them! My workplace just installed a new hot drink machine which normally wouldn't catch my attention. This is because I don't drink coffee and drinks machine normally have all kind of coffee you can think of but not hot chocolate(like our old drinks machine), which is the only few hot drinks I get. However, this particular one has HOT CHOCOLATE! 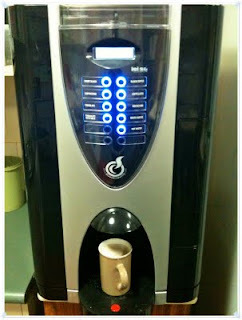 Now staff room becomes my favourite place to go because of this lovely machine. It's our ward YSA Family Home Evening (FHE) night at The Scotts house. 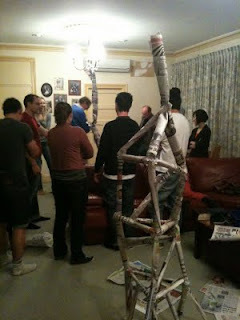 For non-Mormon, FHE is a weekly family night, normally on Monday, where family members will do something together. It is a time for family, to help family members become closer to each other and to God. However, since some of us who are single and doesn't have a family here, the Scotts will normally organized a fortnightly /monthly YSA FHE at their house. The games or activities we do in FHE are always spiritually orientated and good principles that allow us to apply in lives. Pop Pilates videos by Cassey are my recent preference when it comes to choices of pilates guru. She has filmed many different pilates-related videos on Youtube so if you're like me- pilates fan- then check them out. PS: I like how she uses pop songs with all the moves.